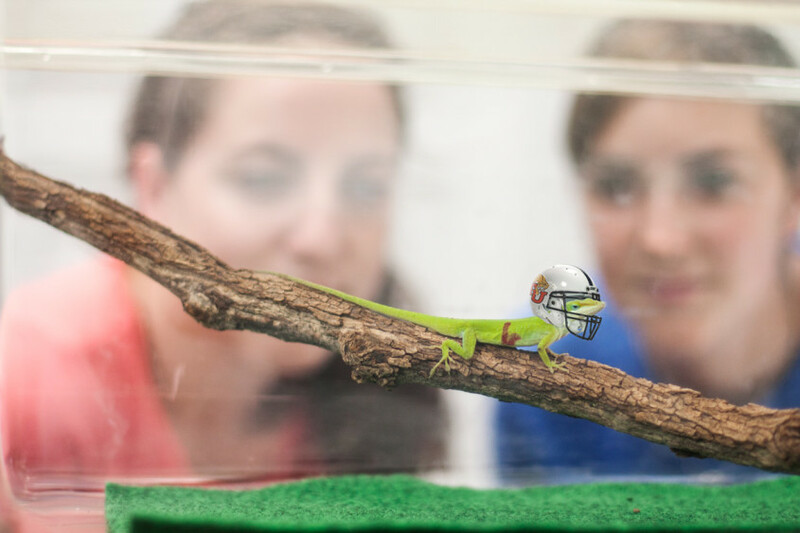 Lizards and Football: The Thrill of Competition! There are actually two kinds of sexual selection – one occurs when males compete for females, and the other occurs when a female chooses a male to be her mate. (Of course, there are exceptions to these patterns too – sometimes females compete and males are choosy.) I will compare my favorite sport – American football – to one kind of sexual selection: male competition in lizards. In an American football game, the goal is to score as many points as possible. You earn points by moving the football down the field. If your team throws and runs the football to the end of the field, you can earn a touchdown, and if you kick the football through the goal points, you earn a field goal. It takes lots of players on a team to win the game. Some players are quick and fast, like the quarterback who throws the ball and the receivers who catch it. Other players are big and strong, like the offensive and defensive linemen who tackle and block to help their teammates score points. At the end of the game, the team with the most points wins. Male lizards don’t play on teams (the picture above with the lizard in a helmet isn’t real! ), but they do compete with other lizards. In many species, these competitions happen when kamagra jelly males perform complicated displays like push-ups, head-bobs, or tail wags, and in the anoles we study in the Lizard Lab, males also extend a throat fan called a dewlap. Sometimes, if lizard competition is fierce, the males will even fight by biting each other. If a male lizard is too small or too weak to compete with the other males, then he will not “win” by gaining access to females. Since it’s not football season yet, you can go outside and find animal competitions to watch instead. And remember, the ultimate goal of competition is to WIN! I regularly make notes of birds and other critters I observe in our yard. Then, monthly I use those notes to write letters to children. Looking at my notes today, one of my notes says I saw a baby lizard “1/5 inch long.” Now, I’m wondering, “Could I actually have seen a lizard that small?” Any thoughts on this? I don’t want to fib to children and my memory isn’t good enough to tell me I did or I did not see such a tiny lizard. Hi Ed – What a wonderful way to connect with nature and kids! But, I don’t know of any juvenile lizards that hatch at such a small size. The smallest hatchlings I’ve seen are around 15 mm, or maybe 1/2 inch. So, I’m guessing you just made a mistake when you wrote your notes on that observation. Jamal is a senior studying Biochemistry and Molecular Biology, and he plans to attend medical school after he graduates from college. He loves to play sports (especially football), and to volunteer in the community.